Copperleaf is an active lifestyle community providing low-maintenance living in Palm City, Florida. This luxurious gated community offers beautiful single-family homes along with resort-style amenities making it a great place for any homebuyer. Residents can enjoy Palm City's hometown feeling and easy access to major highways, shopping, dining, and beaches. Pulte Homes' European-inspired community clubhouse is the focal point at Copperleaf. Residents can stay in shape in the aerobics studio or state-of-the-art fitness center, which offers the latest in cardiovascular and weight-training machines. Many of the community's homeowners gather in the multi-purpose room and those who want to get together with friends and neighbors for a few card games can utilize the hobby and game room. There is also a catering kitchen that's great for preparing a meal to take to a party or event. The beautiful Florida sunshine allows residents to enjoy the outdoor heated resort-style pool almost all year. Two lighted tennis courts make it easy to get in a few sets day or night. Lakes and ponds throughout the community provide serene views and a peaceful setting. Residents can enjoy a beautiful gazebo as well as all of the 140 acres of nature preserves that surround Copperleaf. There's even a tot lot for the little ones. Pulte Homes offers a variety of elegant floor plans that range from 2,063 to 3,472 square feet of living space. These models offer three to four bedrooms, some with dens, two to four bathrooms, and two or three-car garages. Single-family homes are available as new construction or resale, depending on the model. Interior details are well thought out with luxury in mind. Each floor plan includes a lanai, often accessible from the living room, an elegant master suite with walk-in closet, breakfast nook, plus an optional uncovered patio. The energy-efficient homes, enhanced with professionally landscaped sites, feature a variety of exterior options, all with a contemporary Florida ambiance. Earth-toned paved driveways and raised-panel automatic garage doors provide a rich feel, while direct-mount hurricane shutters, patented pest defense and termite treatment systems, and six-zone alarm systems offer the best in safety. This community is not age-restricted and offers the lifestyle and amenities for those looking for maintenance-free living. With an activities director on staff there is always something going on in the community. From card games and potlucks to water aerobics and tennis leagues, residents of Copperleaf will find like-minded neighbors who share similar interests. Just south of Port St. Lucie, west of Stuart and north of Hobe Sound, Palm City has a small town feel with a library, post office and grocery stores. Nearby Stuart and Jensen Beach, bring all of the chains and restaurants you love, as well as beaches and entertainment, such as Lyric Theatre's performing arts. Martin Memorial Hospital is just eight miles from Copperleaf. Hutchinson Island is about ten minutes away with plenty of fishing, boating and beaches.With easy access to I-95 and the Florida Turnpike, Palm City is about an hour from West Palm Beach and about two hours from both Orlando and Miami. 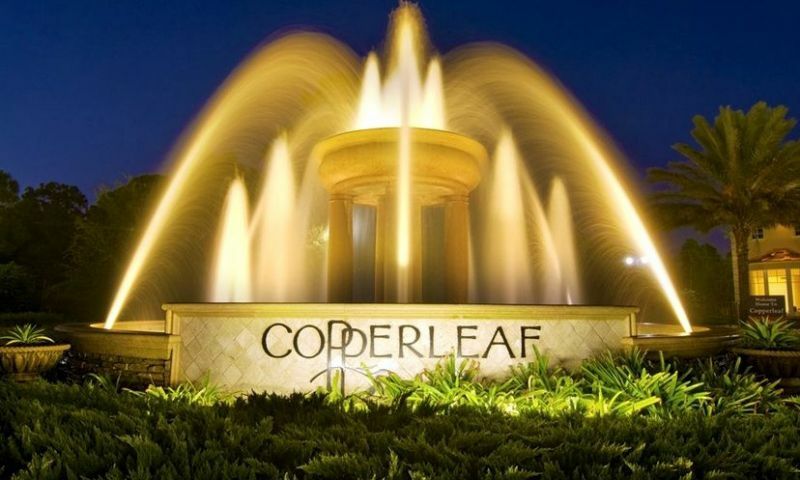 That makes Copperleaf close to all that South Florida has to offer—from the sports of the Miami Heat and Miami Dolphins to the family style thrills of Orlando, plus all the performing arts throughout the area. Copperleaf offers luxurious single-family homes and resort-style amenities that welcome any homebuyer to Palm City, Florida. There are plenty of activities available in Copperleaf. Here is a sample of some of the clubs, activities and classes offered here. Copperleaf offers one and two-story single-family homes. These floor plans range from 2,063 to 3,472 square feet and offer three to four bedrooms, two to four bathrooms, and two or three-car garages. These low-maintenance homes feature spacious floor plans, luxurious fixtures, and elegant master suites with walk-in closets. 55places.com is not affiliated with the developer(s) or homeowners association of Copperleaf. The information you submit is distributed to a 55places.com Partner Agent, who is a licensed real estate agent. The information regarding Copperleaf has not been verified or approved by the developer or homeowners association. Please verify all information prior to purchasing. 55places.com is not responsible for any errors regarding the information displayed on this website.